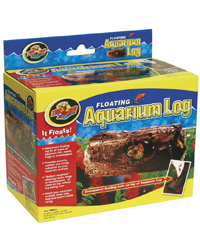 Zoo Med Floating Aquarium Log provides a place to hide in and climb on. The high quality hollow resin construction allows this log to appear just like a natural piece of driftwood. It is easy to clean and will add a naturalistic effect to any tank. The log is slightly weighted at the bottom to prevent it rolling over.